After launch of Android 5.0 Lollipop by Google there is new update that Google Calender and Gmail for Android will have additional features and updated design.New looks will be more intuitive and easy to use. 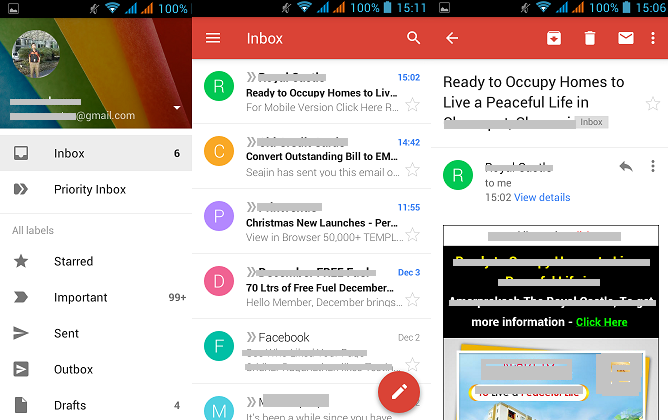 You can get these new features not only in Android 5.0 Lollipop but if you are running android 4.0 Ice Cream Sandwich you can avail these features and new look of Gmail and Google Calender once you will update with new version of app. New Gmail has one red stripe on the top which looks much cleaner and easy to operate. There is one slide out menu shown at the top left so that you can switch account. Primary, Social, Promotions and Updates are still there that also you can view once you navigate through slide out menu. You can feel very easy to operate with new material design aesthetic, added in Android 5.0 Lollipop. Square tweak has been replaced with circular icons for you messages so that it could leave more spaces and look more cleaner in new version of Gmail. The big change is that now you will be able to add IMAP and POP accounts similar to Yahoo Mail. Also now you can add Outlook email addresses to the new Gmail, however these accounts you can add in your android device but this could only be shown in the stock Email app not in Gmail account. These new changes in Gmail definitely going to make your day to day mail activity more easier and more flexible. There are few more changes that makes a less difference from existing app, but still useful. Compose button is added to the right bottom on the screen that will help it compose mail quickly and also you can reply to the mail easily. While composing mail a new attachment button is added on top right that will make easy for you to add any attachment with the mail. One good change is if by mistake you swipe any mail it was going to archive folder but now you have option to set it as you want. So its giving privilege whether you want this feature or not. These small changes are not going to make much difference but still somewhat its easy to operate and more handy to use. Horrible! Hate the color scheme!! Not a good time to introduce MORE unwelcome change! Bloody red stripe at the top. And it can’t be changed. Very, very, very, very irritating. How to change color of this annoying red stripe? I hate this Gmail change and much prefer the previous style. The red stripe is awful and I now cannot find the Refresh button. The new mail button at the bottom is just stupid how it covers email on the list. Someone here has fixed something that was not broken. Retrograde step in the usability stakes and wish I could roll back.